L to R: Nomi Eve, Ann Hood, Lily Tuck, Patricia Park, Lucy Ferriss, and Jean Hanff Korelitz (moderator). 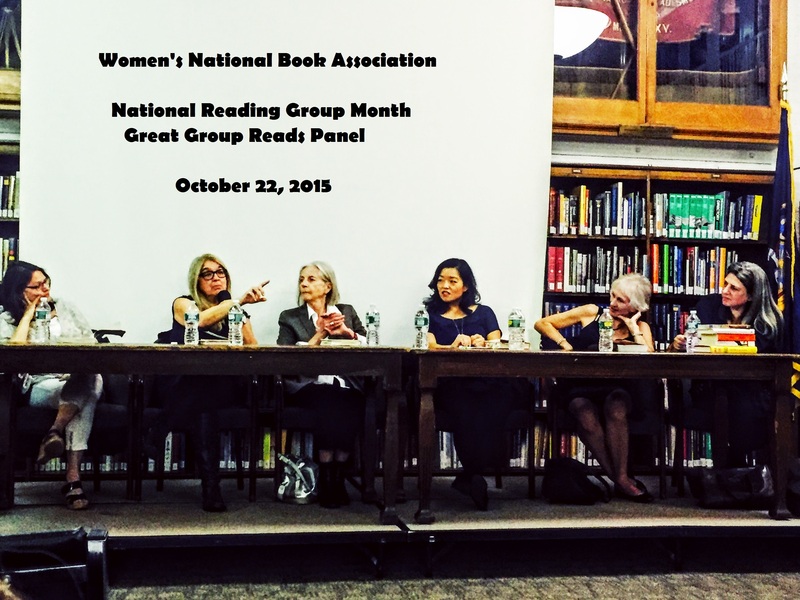 I attended the Women’s National Book Association (WNBA) panel for National Reading Group Month, Great Group Reads, which offered discussion of titles selected for National Reading Group Month. Basically, read these books in your book club. The discussion was lead by Jean Hanff Korelitz who has written numerous works, and has created the organization BOOK THE WRITER, where book clubs and other groups can have the author’s attend their meeting. Having the author at a book club discussion definitely would keep things on target, as most book clubs tend to start talking about personal things rather than the book (and who can blame them, really! Wine definitely doesn’t help :O). There were three main takeaways I had with the panel and panelists. When discussing each of their books (see the list of books below and click on the title to find the Goodreads page), I noticed that they each had a personal tie to their characters, setting, and experience that they translated to the page. For instance, Ann Hood wrote the novel The Italian Wife based on her grandmother who immigrated to the US from Italy and (fictionally) had a love affair outside her marriage. Of course, when writing fiction, liberties need to be taken. In Lucy Ferriss’s novel, A Sister to Honor, the author attended a wedding in Pakistan and wrote a scene in her novel based on that experience. What I can determine from these writers is that experience plays a major role in how the novel comes to life. I especially enjoyed Patricia Park’s interpretation of a modern Jane Eyre set in Flushing, Queens, with a Korean-American protagonist (I bought the book afterward. Park said you do not have to read Jane Eyre first to understand her novel, but since Jane Eyre is one of her favorite books, it certainly doesn’t hurt). Naturally, book clubs were discussed. Author Nomi Eve was the queen of book clubs. She challenged herself to attend 100 book clubs, in-person or through Skype, when one of her novels was published. She’s now attended around 160 book clubs! The general consensus was that book clubs are important in bringing people together and facilitating discussion, though the discussion may take many tangents. The moderator did point out that it’s helpful to the author’s you’re reading if you buy copies of the book rather than get them through other methods, like libraries or a galley bought on eBay. It was a bit disconcerting to hear because it’s not up to the author how readers get their hands on a book. Do you want people to read your book or are you only interested in royalties? On the other hand, if the author was going to go to your book group, it seems that it would be courteous to buy the book for their appearance. I would be interested to hear other people’s thoughts on this concept. The end of the panel was for audience Q&A, then the author’s were available for book signing. I’m glad I attended the panel, the writers were passionate about their books, provided interesting and thought-provoking discussion, and were also relateable and approachable. I think WNBA was expecting more people, but personally, I’m glad there were not as many, it felt more intimate. I also recommend going to The General Society of Mechanics and Tradesmen location in midtown because they have a lovely library space!